Crocheted blankets, sweaters, hats and scarves are homemade treasures that showcase someone’s time, skill and artistic talent. Whether you’ve received one as a gift or done the work for yourself, if you take proper care crocheted will last for many years to come. If the piece is machine crocheted, follow the instructions on the care label. Is the Crochet Yarn Cotton, Wool, or Acrylic? The type of yarn used to make your crocheted garment will determine the best way to care for it. If you’ve done the work yourself, refer to the yarn’s label where you’ll often find care instructions. If you received the crocheted item as a gift or purchase it at a craft fair, ask the crafter or seller. If you have purchased a hand crocheted item at a second-hand store, you can learn how to tell if the yarn is a natural fiber or man-made. To determine if the yarn of your shawl is a natural fiber or acrylic requires removing a bit of yarn for testing. Perhaps it can come from a fringe area or other less important area. Being very careful, light the yarn with a match or flame. If it smells like burning hair and turns to ash, it is a natural fiber. If while burning it has a chemical smell and melts rather than turns to ashes, it is man-made. Another test involves cutting a piece of yarn, unraveling the ends and then putting them back together with a drop of water. Rub the ends together until they feel dry. If they stay together, the yarn is wool, and it has felted. If they don't stay together, the yarn is acrylic or man-made. Superwash wool can be hand or machine washed on the gentle cycle in cold water. Regular wool must be washed by hand in cold water, or it will felt and shrink. Cotton, linen and ramie yarn can be washed in the washing machine on a gentle cycle using either cold or warm water. Acrylic and other synthetic yarns can be washed and dried in with your regular laundry as they do not shrink. Unknown fiber content items should be hand washed in cold water and laid flat to dry. For hand washing, choose a mild detergent and cold water. For wool fibers, choose a formula developed for wool or mild baby shampoo. Specialty detergents containing contain lanolin are available, such as Eucalan. Lanolin is a natural oil produced by sheep and helps preserve wool fibers and increases the water resistance of wool. This type of detergent should be used for crocheted outerwear. Hand washing may seem like a lot of trouble, but you can be sure that plenty of work went into creating your crocheted item. If you have a very large hand crocheted piece like a tablecloth or bedspread that should be hand washed, use your bathtub or a very large plastic storage tub. The pieces will be heavy, but this is much preferred to using a washer to prevent damage from excessive agitation. If you choose to use an automatic washer, you must use a front load washer without a center agitator which is more gentle on fabrics. Gently agitate the crocheted item in the solution of detergent and water. Never wring or scrub. Lay the item flat on a dry, absorbent towel and roll up in the towel, firmly pressing as you roll. Do not wring the towel. This will absorb the excess water. Transfer to a dry bath towel on a flat surface large enough to hold your garment with arms extended if appropriate. A card table is the perfect size for air-drying sweaters and typically has a protective vinyl top. Always protect wood surfaces with a vinyl tablecloth under the towel. 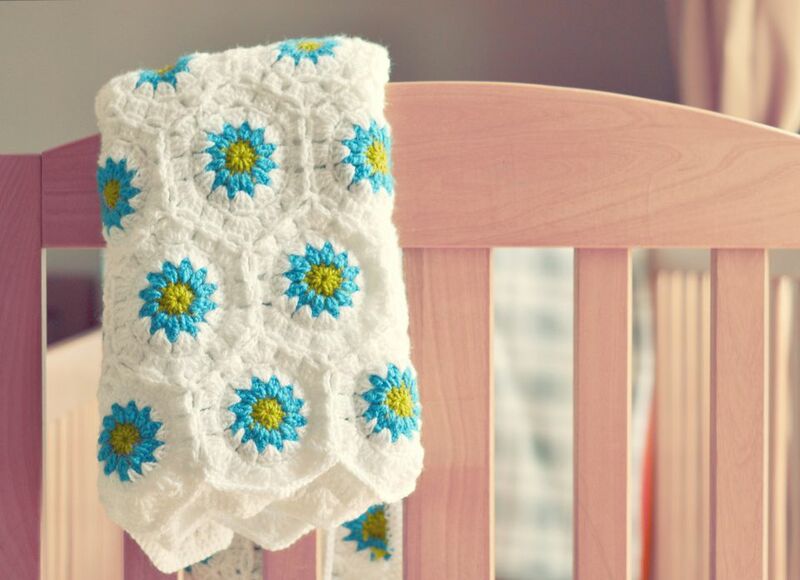 Place the crocheted item on the dry towel and reshape into its original shape. Pat it into shape; avoid tugging or pulling. Gently push the ribbing together at the neckline, wrists, and waist. Fasten buttons. Fold collar. Allow the item to dry for 24 hours. If not completely dry, Flip the item over onto a dry towel, arrange into shape (the shape will have set by now, but you don’t want to add wrinkles or slow drying), and dry for another 24 hours. Fold your garment and put it away. Never hang a crocheted garment. The weight will stretch out the shoulders very quickly. For very large pieces like a blanket, spread some heavy plastic over the floor or bed to protect the surface and then place dry towels over the plastic. Stretch out the piece to begin the drying process. You will probably need to replace the towels after several hours. Turn the crocheted piece to allow even drying. If the blanket is machine washable, it can usually be dried in an automatic dryer on medium-high heat. Some crocheted linens and pieces call for starching or stiffening the items so that they will hold a certain shape. There are many recipes for “stiffeners” including some using glue, sugar, flour, and shellac. Here are two recommended methods using laundry starch. Spray Starch: Lightly spray the crocheted piece. Press using a warm iron, on the wrong side and covered with another piece of material gently pulling it into the desired final shape. You can also spray, shape and pin your piece to a chunk of Styrofoam, cardboard or ironing board using rust-proof pins. Spray starch isn't permanent and must be repeated after each time you wash the item. Liquid Starch: Dilute the liquid starch with water unless you want the crocheted piece to be stiff. Dip the item into the starch covering item completely then gently squeeze out excess, do not twist. Allow the item to dry and press using a warm iron, on the wrong side and covered with another piece of material gently pulling the piece into the desired final shape. You can also dip, shape and pin your piece to a piece of Styrofoam, cardboard or ironing board using rust proof pins. Liquid starch isn't permanent and must be repeated after each time you wash the item. Help! Can I Unshrink my Sweater?